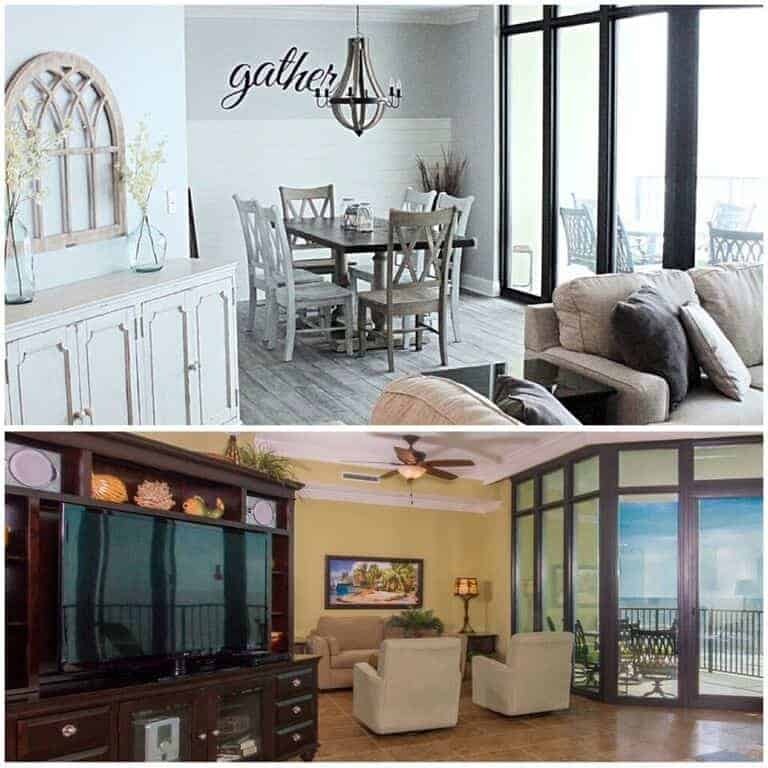 Do you ever wonder how to get that white washed light wood furniture finish? Have you ever stopped your scroll through Pinterest when you landed on a beautiful “white oak” looking piece of furniture? This can accurately describe me in the past few months. 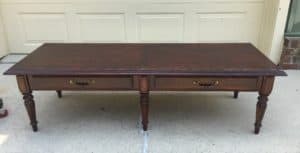 I have a solid wood Ethan Allen coffee table sitting in my garage that is screaming for a makeover! 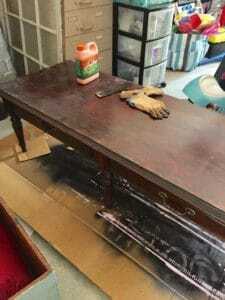 Come along and I’ll share my adventure as I lime wash this coffee table with liming wax. 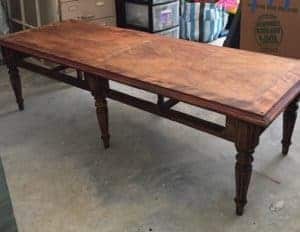 I scored this coffee table from a friend who sells antiques for $30. 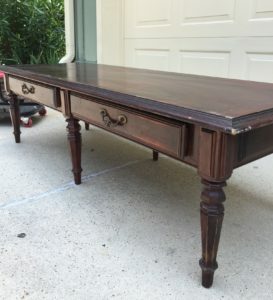 She needed to get rid of it and I happened to need a coffee table (like I needed a hole in the head, lol). If you’ve been around here long enough you know I don’t pass up solid wood furniture! I loved the lines in this coffee table. It’s big, it’s heavy and it was screaming to get rid of that dark wood! How do we lime wash wood? First we needed to strip off at least the first coat of sealer. Liming wax is meant to set in the open grain of the wood. 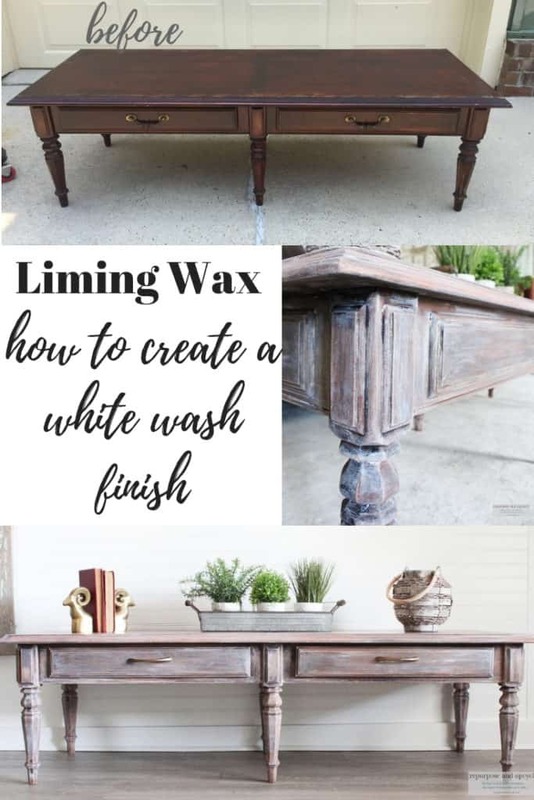 Unlike regular wax, which is meant to highlight the moldings, liming wax highlights the wood grain to give it that white wash finish. Because liming wax has to penetrate the wood to the grain, I had to remove the top layer of sealer. 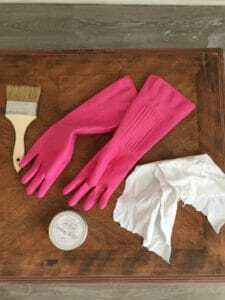 I had my CitriStrip paint stripper, paint brush and gloves and I was ready to go! 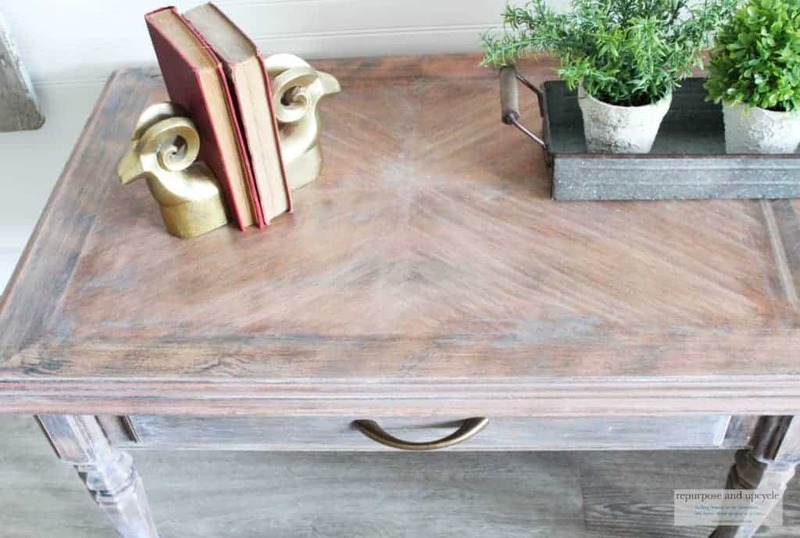 I won’t go into too many details on how I stripped the finish off of this coffee table because this post is mainly about my lime wash finish. 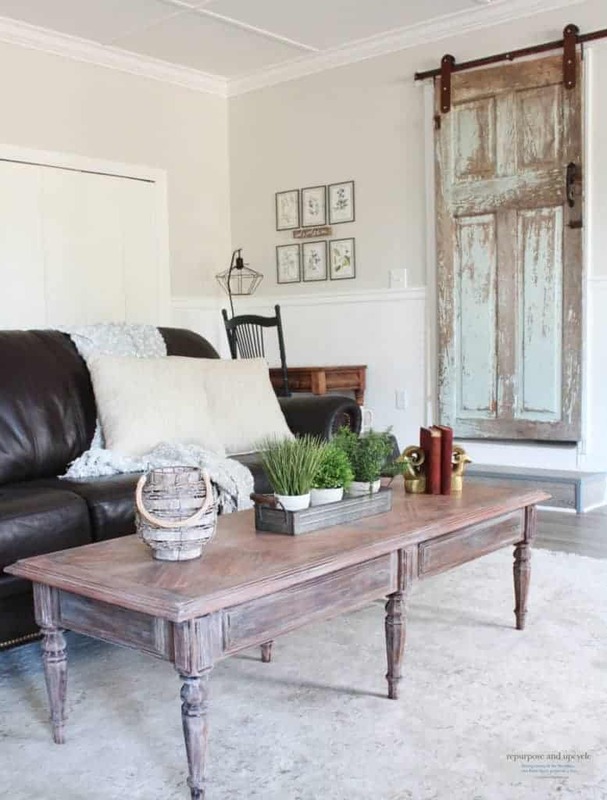 If you are interested in seeing more about how I strip most of my furniture flips (and a handy little hack), check out my post HERE. Below is what the coffee table looked like after I stripped at least the top layer off. Now to start the liming wax process! 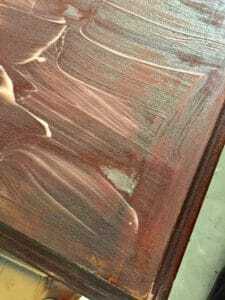 For this project I decided to use the Amy Howard Liming Wax. I’ve heard great things about it so I knew I had to try it out. First I have to say, there are a ton of ways to apply the liming wax. 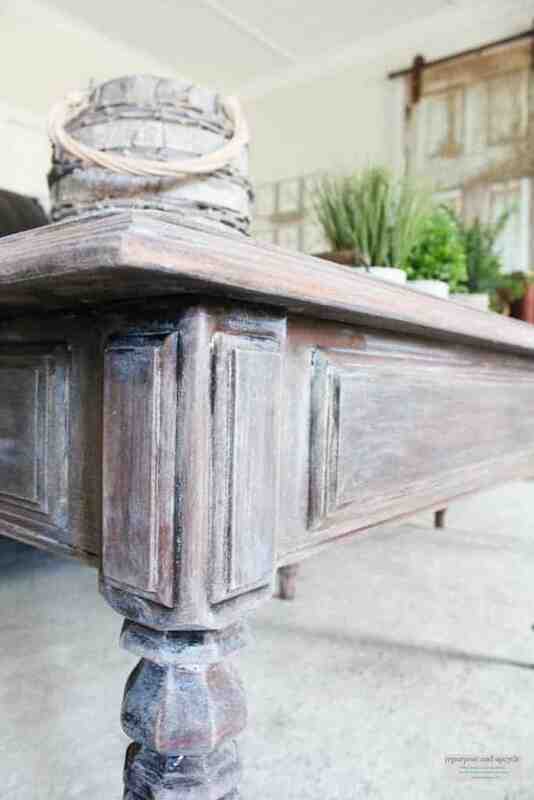 I’m going to show you a few that I’ve used on this coffee table to lime wash it and give it a white washed look. I started with applying the wax to the top of the coffee table. I dipped the rag into the wax and pulled out a dime size portion and then started to apply the wax IN THE direction of the grain. 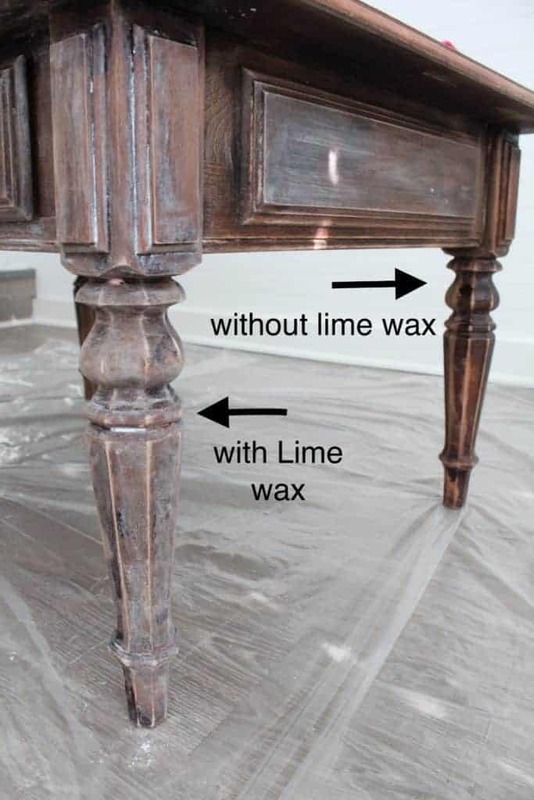 A quick note: Liming wax is best used on an unfinished open grain piece of wood like Oak to highlight the wood grain. 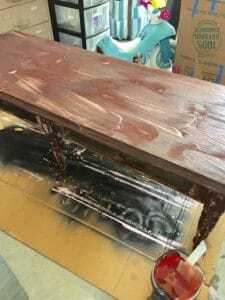 This coffee table has been heavily stained, and even though I removed the first layer of varnish and stain, the wax will not penetrate the wood grain. 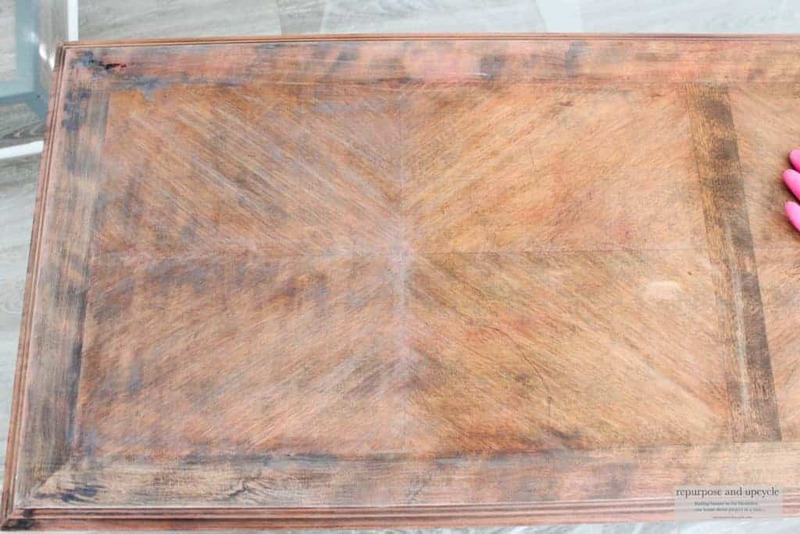 Because of this, I’m using the liming wax to lighten or “white wash” the table and cover up some of the red tones. As you can see, the left side is where the liming wax has been applied vs. the right side where it has not been. After I finished lime waxing the top, it was time to do the spindled legs. I wanted the legs to have a heavier “white wash” finish. After I finished waxing the entire piece, I was practically done! Easy peasy. Want to see more details with a video about the process? 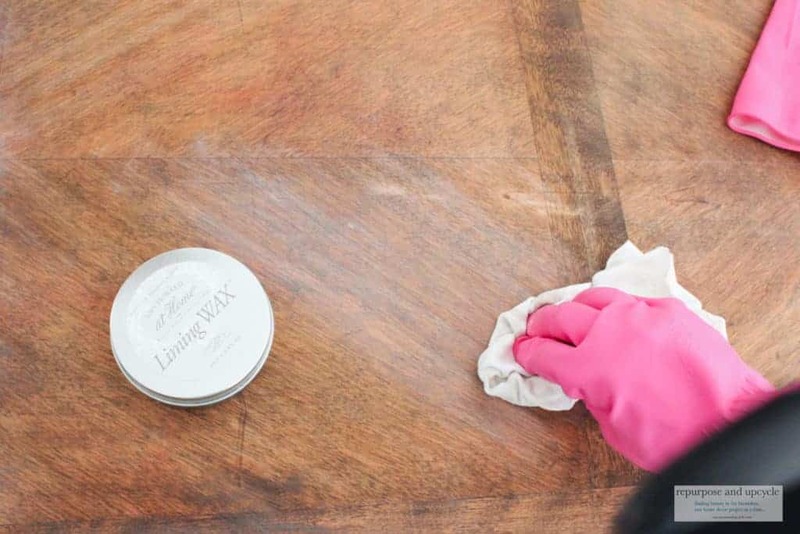 Head on over to my YouTube channel for my video on lime waxing this coffee table. I’m so pleased with how this coffee table makeover turned out! If you enjoyed this post feel free to pin the image below to Pinterest. 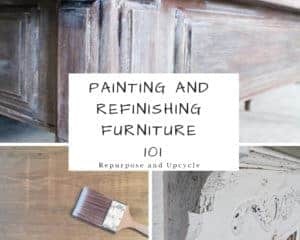 Want to see more Furniture painting and refinishing posts? Click the image below. Want to see more furniture flipping inspiration? 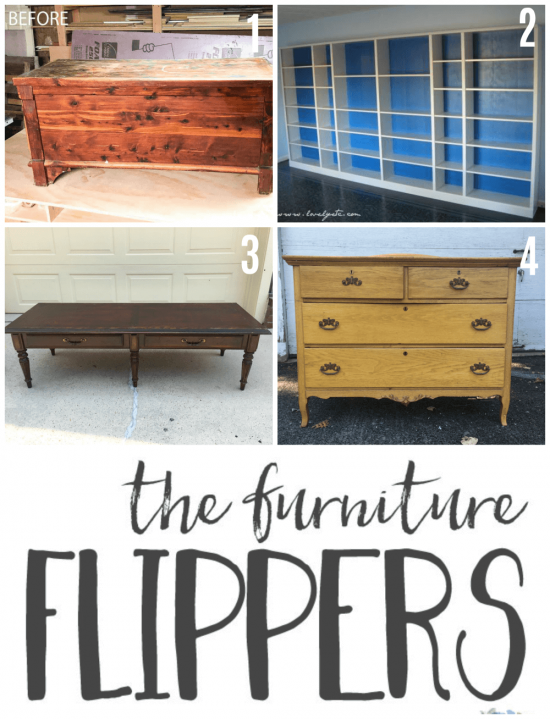 Come check out my super talented blogger friends and their furniture flips below. How to Build Easy Built Ins from IKEA Bookcases by Lovely Etc. Thanks for following along guys! I have always wanted to try lime wash. This coffee table turned out amazing! Thanks Kati!Have a great weekend. I love this look! When i redid my kitchen I stained them first w a soft pink, then white washed them w a grayish white. They were so awesome. I didn’t know about this wax but am going to try it out…it’s a nice middle ground between painting furniture whiie and leaving it natural. It has that French esthetic that I want in my house. Thank you for sharing! It does have a french vibe to it doesn’t it! Thanks for stopping by and definitely give this stuff a try! I’ve been seeing more and more lime wax furniture pieces around. That must be coming back in style again. I’m excited about it because it was always a favorite. Your table turned out great, love the way it toned it down a bit. Thanks for all of your great tips on liming. I have never done it but I love the look and maybe now after seeing your tutorial, I will give it a try. I love it! Thank you for sharing at The Clever Chicks Blog Hop! This turned out so well! Love the way you styled the top, too! 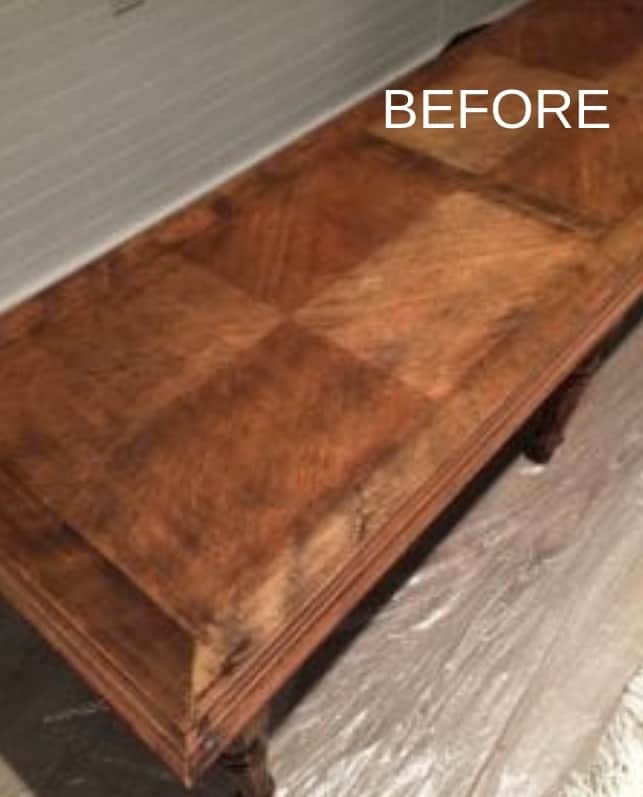 This table makeover turned out beautiful! Thanks so much for sharing at Party in Your PJs link party! 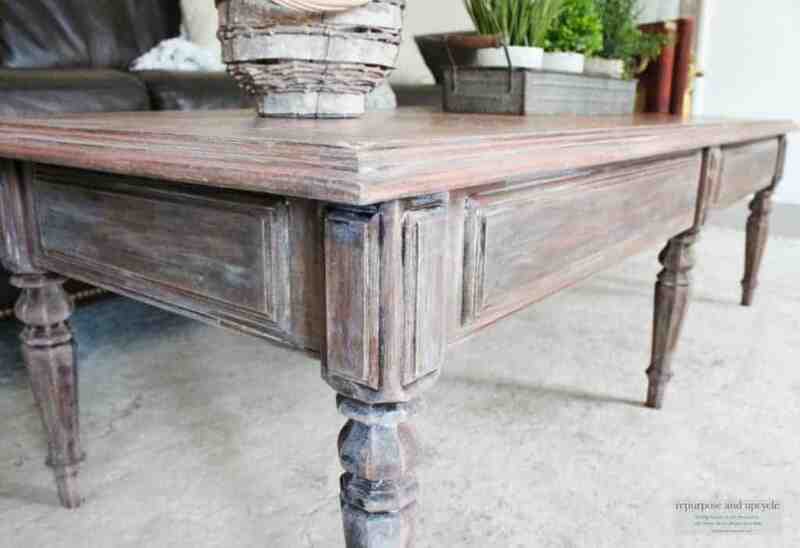 Love your new limed “old” coffee table. Well done! Have a great weekend. It turned out perfect! I have never used Lime Wash before. Great job!! Thanks for sharing it with SYC. Wow, what a makeover! I’ll have to try lime wash. I love the finish. Thanks for the inspiration and sharing on Sunday’s Best. What a cool way to update an old piece of furniture. Love it. I love the look of the coffee table. This is definitely a technique I will be trying. Thanks for sharing at the Snickerdoodle Create Bake Make Party. Lindsay, I chalk paint all the time, but I’ve never lime waxed.. This is awesome look. 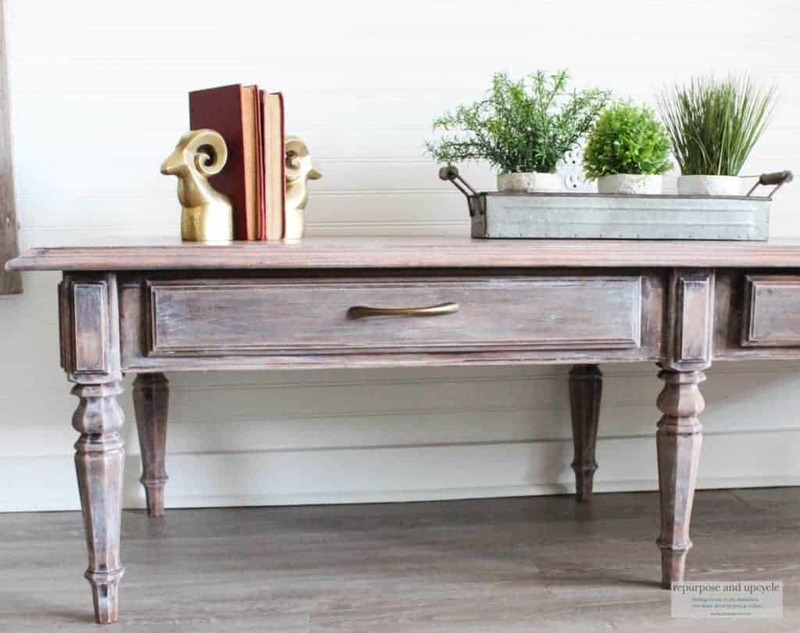 Have you ever done a lime wash on a lighter stained piece of furniture? I have some dining room table chairs I was going to chalk paint, but maybe I will try a lime wash ?? hmmm Thanks for sharing last week at #TuneInThursday – I am featuring your post tomorrow. I think the lime wash would actually work a little better on a lighter stained furniture piece! I have never tried it but I’ve seen a lot of lighter furniture pieces that have been lime washed and I love it! Good luck and let me know how it goes. Oh and thank you so much for the feature. Have a great weekend. Pingback: What's Up With Furniture Wax and Why Do You Use It? Hi there, I'm Lindsey and I'm so glad you're here. I don't have a handyman in my back pocket or mad craftsman skills, I'm just a girl with a desire to create. I love simple DIY's, budget friendly home projects, refinishing furniture and scoring vintage finds, all on a budget of course! Click my picture to know more. Also, if I can do it you can too so feel free to drop me a comment if you have any questions.